You know that citrus is a winter fruit, right? For all the press that lemons and lemonade get in the summer, the zesty fare isn't even in season! Take a look around the grocery store at this time of year and you'll see an impressive array of citrus in every size and color. We have a Meyer lemon tree with a very small harvest, I recently picked my one lemon and had to decide what special way I would use it. 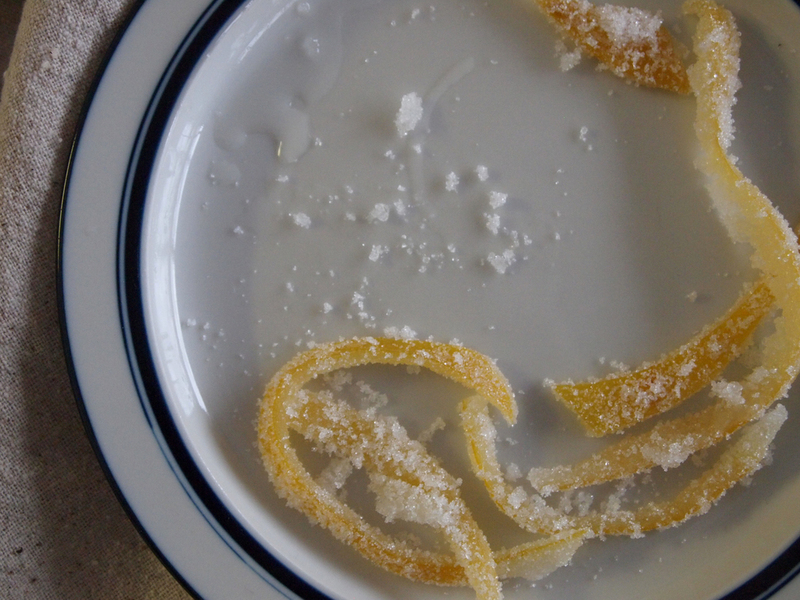 A few months ago, Ben and I talked about candied lemon peel and I've had browser windows open on my phone with recipes ever since (because I'm all about the tabs). I supplemented my supply with store bought Meyer lemons and started re reading those recipes. Let's get to the process. 52 Kitchen Adventures was my main source for this recipe. First, peel your lemons. I've read instructions that tell you to use a paring knife to separate the flesh from the peel. I tried some like this, and then also used a vegetable peeler with a heavy hand to peel the lemons and include some of the pith. I couldn't tell the difference in the final product so I would use a vegetable peeler when I do this again. Bring to a boil and simmer for 3 minutes; drain. Fill the saucepan with 2 cups of water and 2 cups of sugar. Place over medium heat until the sugar is dissolved. Place the peel in the pot and simmer for 15-20 minutes until the skin is translucent. Drain and store the liquid for another use (lemon simple syrup can be used to sweeten and flavor drinks). Dredge the peels through the last cup of sugar and dry overnight. Store in an airtight container packed in sugar. I used this as a cupcake topper and you could use it similarly on other baked goods. You could also cut it up and include inside cookies or muffins. It would also make a good garnish for drinks, or you could just eat it as a candy. We're thinking of using it as a topping on a spicy entree. Have an idea for how to use it? Let us know!